As New Year’s Eve approaches, many savvy imbibers are laying in a supply of Coconut Water, purported to be the best “morning after” pick-me-up on earth. 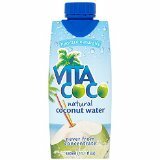 Whether this is true or not, it does contain an array of vitamins, minerals and electrolytes, and has become wildly popular. 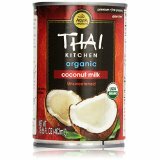 It is simply the liquid inside a coconut, sometimes erroneously referred to as coconut milk. More fun than consuming from a bottle is to sip straight from the source, perhaps from a street vendor in the tropics, or at markets all over the world, even in two mile high Cuzco, Peru. The origin of the coconut, whether from the Philippines or Asia or even the Americas, is still being debated. It is thought that earlier species were more buoyant than today’s, more easily transported serendipitously on the ocean currents. But there are also arguments that coconut dispersion occurred when people inhabited new lands and cultivated them. Coconut milk, coconut cream and cream of coconut are all products derived from adding water to pulverized and squeezing out the liquid, the milk being the most watery and the cream of coconut, the least. 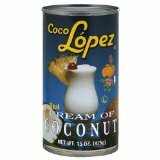 In the US, the best-selling brand of Cream of Coconut (Coco Lopez) is thick, has added sugar (as well as preservatives) and packs a whopping 130 calories per fluid ounce. It is also a critical ingredient in delicious Pina Colada, a mélange of said coconut plus pineapple juice and rum; if you have to ask about the (mega) calories, just order rum and diet cola. Coconut oil has had a rebirth in popularity. It was believed to be dangerous, based on old studies that examined hydrogenated coconut oil. 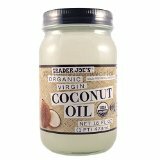 Pure coconut oil is reputedly healthy, and has a very high flash point, meaning that it remains stable at unusually high temperatures, making it good as a frying medium. 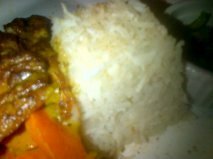 Of course, coconut pulp is an ingredient in lots of delicious foods, including coconut rice, which myMEGusta discovered in Barbados. 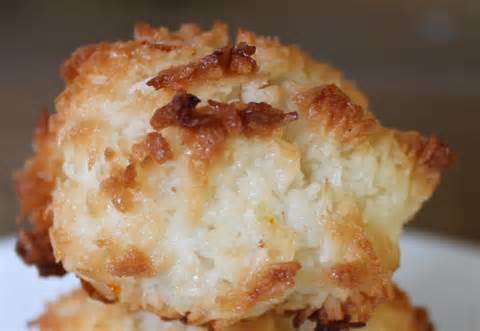 As for macaroons, she prefers the coconut variety over the currently chi-chi French macaroons made with almonds. And what’s not to smile about with coconut cakes and coconut cream pies! 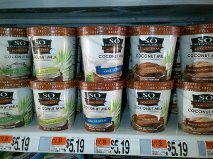 You can even get coconut milk ice cream. There’s an urban myth that 150 people per year meet their end by being bopped by a falling coconut (more than are killed by sharks!). When digging into the subject, myMEGusta learned that this is a number someone made up. But, responsible coconut palm owners do keep their trees harvested, just in case. My daughter made a great red lentil dish for Christmas dinner. She furiously cooked the lentils in coconut oil for two or three hours and added salt, pepper and cumin. They were delicious. 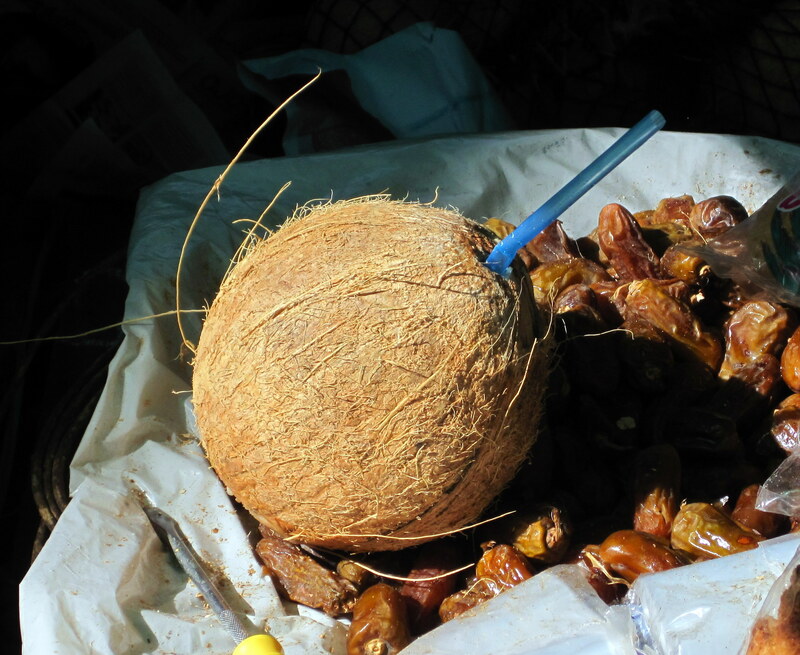 Good advise for not spending too much time under a coco palm with ripe nuts hanging overhead. This is even more important to remember on the Seychelles Island, home of Coco de mer. The slow growing huge nuts resemble coconuts and weigh 20 lbs. or more. They inside becomes an edible jelly after around nine month, but when fully ripe the core is stone hard and inedible. I enjoyed a coconut cream greek yogurt the other day.